Home ・ Blogs ・ European Social Democracy Extinct? “In a constitutional state, the true ruler is the voter”, go the words of Ferdinand Lassalle, the champion of workers and intellectual force behind European social democracy. But in the meantime, the voter has – more than 150 years later – clearly lost faith in Lassalle’s political idea. Almost everywhere in Europe, social democratic and socialist parties are losing support: last year, the German SPD saw a historic bad result in the parliamentary elections. Its sister parties in France, the Netherlands and the Czech Republic have even sunk to single digit shares of the vote. 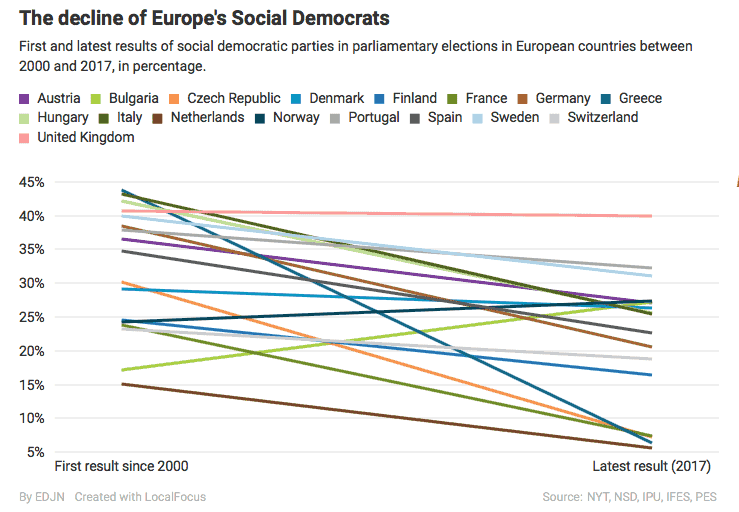 European social democracy is fighting for its political survival: since the new millennium, its vote share has fallen in 15 of the 17 countries we examined – sometimes dramatically. In Germany, the SPD result in 2017 federal elections was the worst since the end of the Second World War (at 20.5 percent). But, at the turn of the millennium, it was the strongest party: Gerhard Schröder led it into government in 1998 with 40 percent of the vote; in 2002 it won 38.5 percent and again named the Chancellor. Since then, however, it has gone downhill. Particularly after the Grand Coalition from 2005 to 2009, when voters punished the SPD, the junior partner; its vote share collapsed by more than ten percentage points. After a slight increase in 2013, the downward trend has resumed. Last year in France, the Socialist Party (PS) entered its worst ever crisis. President François Hollande, the most unpopular person to hold the office in history, did not even stand for reelection. The party’s candidate, Benoît Hamon, finished in fifth place, with a mere six percent of the vote. A few weeks later came the vote for the National Assembly. In 2012, the PS became the strongest party, this time it fell by more than 20 points and won only seven percent of the vote. In Austria‘s recent vote, although SPÖ was able to match its results of four years ago, it nevertheless left the government and has lost almost ten percentage points over the past 15 years. Until recently in the UK, the Labour Party was following the same downward trend, losing ten percentage points between 2001 and 2015. But Labour was able to recoup its losses in last year’s general election and clearly profited from the consequences of the Brexit vote earlier in the year. In every country there are of course differing, individual reasons for this development. But there are also common roots that can explain the crisis faced by socialists and social democrats in many countries. First, parties have lost many of their core voters. European social democracy, born out of the labour movement of the nineteenth century, had a large support base upon which it could rely for votes: the workers, above all people engaged in manual labour. It is now an ever shrinking demography: the working class is fragmented, the conditions that supported the social democrats for decades across Europe have disappeared. Industrial jobs are being made superfluous by new technologies or are moving to countries with lower wages. High earning permanent staff work alongside wage workers, who often do the same tasks but receive less money for them. In Germany, the share of traditional workers fell in the last 50 years from half the workforce to barely a quarter. And surveys carried out after elections illustrate that the remaining workers no longer only vote for the social democrats. Second, in the past couple of decades, parties on the political fringes of many countries have emerged or have won approval. 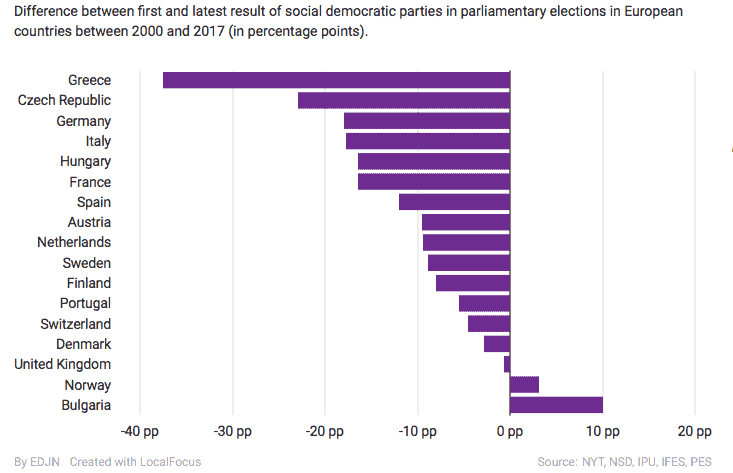 Socialist and populist left-wing parties have been able to win over voters who earlier voted for the social democrats. It is, to some extent, what Syriza in Greece has managed, along with the left parties in Portugal and Denmark, or Die Linke in Germany, which is the successor party to both the East German Communist Party and the West German WASG. At the same time, populist right-wing parties are appealing to the remaining traditional working class – like the Front National in France, the FPÖ in Austria, Geert Wilders’ party in the Netherlands and the AfD in Germany. Third, people have long been concerned by a fundamental crisis among mainstream parties. Voter commitment is decreasing, or worse: trust in politics as a whole is dissolving. Many countries in Europe are struggling with diminishing voter participation. In Germany, around 90 percent of voters went to the ballot box in the 1970s, while in the 2000s that figure was only between 70 to 80 percent. In France, participation in the second round of the parliamentary vote last year fell to a historic low, and in Greece, too, disengagement with politics is high. What would a future for European social democracy look like? How can it respond to the challenges of a globalised, digitalised world? And will it manage to win back voters’ trust? Europe’s next parliamentary election takes place in Italy in March. Matteo Renzi, the head of the fractious social democratic party Partito Democratico, would like to lead it back to power once more. Renzi sees himself as playing a similar role to France’s President, Emmanuel Macron, who presented himself as the renewer of the political scene. Yet in the polls, the anti-European Five Star Movement and Silvio Berlusconi’s right-wing alliance are in the lead. A big comeback for social democracy is not yet on the cards. The observations above use the electoral results from 17 European countries. They were collected by the Norwegian Centre for Research Data and the International Foundation for Electoral Systems and processed and compiled by the New York Times in a different context. We have added any missing data. Marcel Pauly is a graduate of Columbia School of Journalism and a former member of the investigative team at Die Welt. 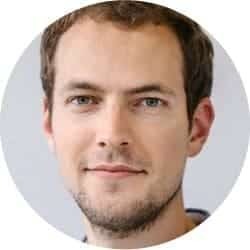 He joined the data journalism team at Der Spiegel in September 2017.